Last year, Blake Crouch and I wrote a horror story called SERIAL. It was the #1 Kindle Bestseller for six weeks, and has been in the Top 100 for 275 days. It's been a signed, numbered, limited edition chapbook. It will soon appear in the upcoming Shivers anthology from Cemetery Dance. This 7500 word tale has been downloaded over 200,000 times. The overwhelming response was polarized. Some loved it and wished it were longer. Other wished they could "unread" it, attacking us for writing such filth. Amazed at the traffic and attention our little story has received, Blake an I began to think about how we could make SERIAL bigger, longer, and rougher. The result is SERIAL UNCUT. 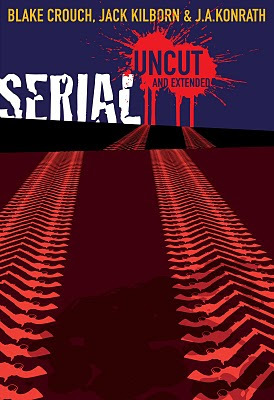 SERIAL UNCUT is over 36,000 words, much of it brand new. Along with the insertion of additional material too extreme for the original version, it also has a vastly expanded beginning and ending, including an extended section that originally appeared in the novella TRUCK STOP. The authors are in no way responsible for any lost sleep, missed work, failed relationships, or difficulty in coping with life after you have read SERIAL UNCUT. They will not pay for any therapy you may require as a result of reading SERIAL UNCUT. They will not cradle you in their arms, rock you back and forth, and speak in soothing tones while you unsuccessfully try to forget SERIAL UNCUT.